Oh, so corny, I know, but how could I resist? These are my ornaments that I made for the Holiday Ornament Swap. 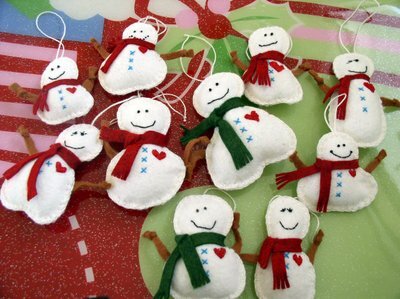 I stacked two layers of white wool felt, cut out snowmen shapes, then embroidered faces, buttons and hearts on one layer, put the two sides back together and blanket-stitched around them, adding some stuffing right before the end. The arms (they're supposed to look like sticks, in case you couldn't tell) are knotted strips of brown wool felt. Everything was sewn by hand, of course, the way I usually sew, and the thread was perle cotton size 8, I think. The tallest one is just about 3 inches high. Really fun to do, and probably one of the first times I've ever been completely free of patterns. No ruler, no measuring, nothing exact, no outline of where to put the features. I just kind of picked up the needle and sat on the couch (usually after 11 pm), and lost myself. Poked myself in the finger a couple of times as I nodded off, but no blood got on any of them, I promise. They are just so sweet! What can't you do???!!! Wow! Those are so cute! They are truly wonderful! michelle, thanks so much for the cute little guys! he melted my heart when i opened the package. i can identify him right away in this picture, they're all so unique! They are wonderful! I love how you don't use a pattern or a machine, they just "happen". Unique, individual, and adorable! I received one of these beautiful snowmen!! I love it Michelle!! Thank you so much! These are so sweet! I love that they are all different! So cute!! I love the snowmen!